...the kids will appreciate the cooler swimming pool at 29 degrees Celsius. 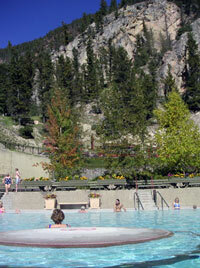 At Radium you will enjoy Canada's largest hot spring pool set in rocky and natural surroundings. With the hot pool usually around 39 degrees Celsius, the kids will appreciate the cooler swimming pool at 29 degrees Celsius. If you are visiting in the winter, you will find the heated winter pool entrances pleasant. Following your soak, you can enjoy the poolside cafe and cappuccino bar. This area in British Columbia is known for its great alpine and cross country skiing as well as world-class golf facilities. If you are visiting Radium Hot Springs, you may be interested in The Redwall. This sedimentary formation is redish in colour due to the oxidation of the iron in the rock. It is at the Redwall fault that the mineral-rich waters bubble to the surface and feed Radium Hot Springs. Radium Hot Springs is located 260 km west of Calgary. If you are driving from Calgary, Canmore or Banff proceed west on the Trans-Canada highway (Highway 1) to Castle Junction in Banff National Park. At Castle Junction, take Highway 93 to Kootenay National Park and Radium. If you are staying in the town itself, the hot springs are three kilometres east of the junction of Highways 93 and 95. Treat yourself to the Day Spa "Pleiades Massage & Spa" and soothe your mind and body with such treatments as aromatherapy, facials, massage, Shiatsu, reflexology, hot stone and Reiki. Family rates admit two adults and two children. Adult (18-64 years); senior (65 years and older); child (3-17 years). NATIONAL PARK FEESNational Park Entry fees do not have to be paid while visiting Radium Hot Spring. However, Park Entry fees MUST be paid to continue into Kootenay National Park or to Proceed into Banff National Park.